This plugin is just as simple as the name – it allows you to remove the core WooCommerce product sorting options from the shop loop and admin. Want remove the default WooCommerce sorting option? You got it. Remove sorting by sales? Yep, can do that. Please note that if you use the Avada theme, this plugin will not work. This theme incorrectly hardcodes WooCommerce sorting options, rather than allowing them to be changed by plugins, so our plugin cannot work until this theme fixes its sorting option handling. 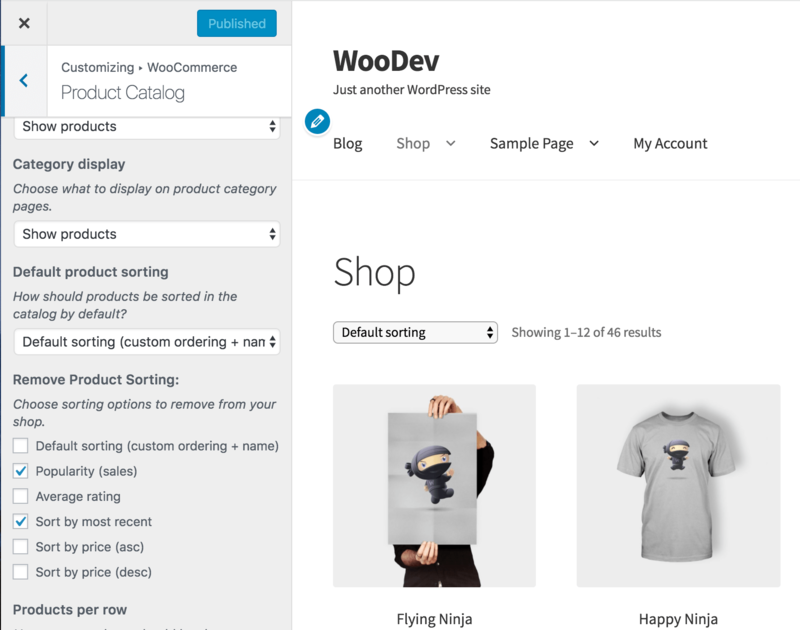 When the plugin is installed and activated, you’ll be able to select which sorting options to remove under Appearance > Customize > WooCommerce > Product Catalog. Select the options you’d like to remove, then click “Save” to update your settings. That’s it! Want to contribute or learn more? Check out the WooCommerce Remove Product Sorting repo on GitHub. We also wrote a blog post on how this works in case you’d like to know how to remove WooCommerce product sorting options yourself 🙂 . Need to add sorting options instead? We’ve got a free plugin for that as well – check out WooCommerce Extra Product Sorting Options. If you’d like to get automatic updates, you’ll need a license key to get them from our site as we release new versions. You can do so by checking the email you got after downloading the plugin, or your purchase receipt page. Quick tip: Need your purchase confirmation? Search your email for “Your SkyVerge Purchase”. Now copy this key, and on your site, navigate to WooCommerce > Extensions > SkyVerge Licenses. Enter the key you’ve copied, and save your changes. This will now link your site for automatic updates. Once you’ve saved your updater key, you’ll get notifications of updates to this plugin so you can automatically upgrade. Please switch to a default theme, such as Twenty Seventeen, and view the sorting options with the default theme and no other plugins. This resolves almost every issue, as some themes hardcode the sorting dropdown in a way that won’t allow plugins to modify it. You must contact your theme author to resolve this. If you see issues adjusting settings within the customizer, this likely indicates a plugin conflict. To rule out plugin conflicts, please deactivate all plugins except WooCommerce and WooCommerce Remove Product Sorting, then re-check the settings to see if the issue has been resolved. These steps resolve almost any display issue. If you’re looking for assistance with customizing your store sorting further, we recommend reaching out to Wisdm Labs or Codeable for assistance with these sort of projects.